It has been 40 years since Secretariat swept the Triple Crown, becoming the first horse to win the Kentucky Derby in under 2 minutes (1:59 2/5, still the record), making a last-to-first finish in the Preakness and annihilating the rest of the field in the Belmont with a winning margin of more than 31 lengths. 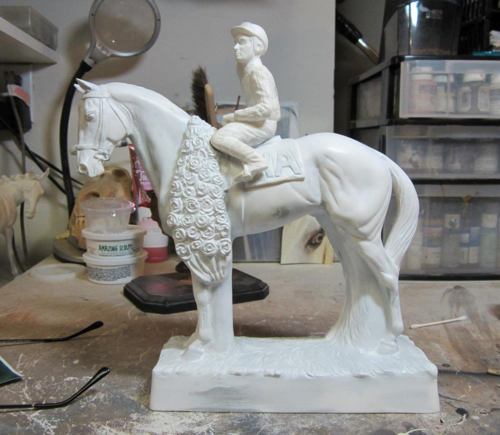 To commemorate the 1973 Triple Crown, 500 ceramic decanters in the style of those that became collectibles in the 1970s are being created in the image of Secretariat, with jockey Ron Turcotte aboard. They will be filled with 750ml of Four Roses bourbon hand-selected by Secretariat owner Penny Chenery and master distiller Jim Rutledge during a visit to Four Roses’ Cox’s Creek facility next month and unveiled on May 1 at a special event at the Kentucky Derby Museum. 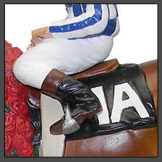 Each of the numbered decanters will be signed by Chenery and Turcotte, who will attend the event. Also available that night will be a special barrel selection of Four Roses in limited-edition “Secretariat bottles” featuring the blue-and-white checks of the Meadow Stable silks. Rutledge will lead a tasting of the Four Roses barrel selection. The decanters are $320 each, and the May 1 event ($50/person) is the only opportunity to purchase them. The commemorative bottles of Four Roses are $124.99 each. For more information and to reserve your spot, click here. As a Kentucky girl, I certainly relate to Ms. Chenery’s quote in the Four Roses news release about the decanters: “Fast horses and fine Bourbon are two of my favorite things.” And I am sort of absurdly excited about this decanter, maybe because I remember seeing similar ones when I was a kid and thinking they were cool.